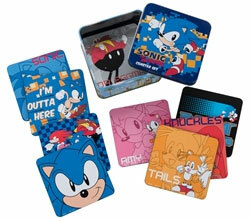 Set your drink down with Sonic style when you have this box set of 10 different classically styled coasters. These are all square, and come inside a collectible storage tin. The set has fun designs and some neo-classic art to spice it up as well. You can see a "portrait" coaster for Sonic, Tails, Knuckles & Amy. Then, there's an "I'm Outta Here" slogan coaster, big Sonic face, all characters on 1, & a mostly black with speeding Sonic. If you consider the Eggman graphic in the tin as a design, there are only 9 designs shown here. What is the 10th coaster? What are these made of? Where can you find the set? Coasters don't have to be used for their intended purpose, they make fun shelf backgrounds, display items and more. It's nice to see solid design without the use of 'faux wear' on household products like this. Another new mug for 2016! Here's the "Logo Inside" Green Hill Mug. It has neo-classic Sonic drawn large/angle running on one side & a pixelated Green Hill background. The added detail here that most mugs don't have, is interior printing. They've added the classic Sonic logo to the top inside of the mug, so you see it when the Sonic graphic is faced toward you. The neo-classic art makes it fresh, and the logo inside adds fun extra detail to combine into a fun mug to collect. Where will it be sold? This is called the "Sonic Spray Towel". It's from GE Entertainment, & has more of a paint spatter / splats effect than a spray. It's a big beach towel size. 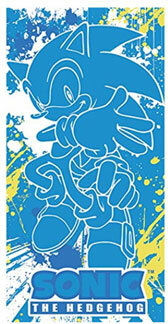 The Sonic design is all in solid blue with white outline. It's 'sideways peace sign' Sonic & he's about as big as the whole towel. The modern logo is also all in blue at the bottom. The dynamic scribbles, yellow splashes & white spatter keeps this towel looking active & fresh. This is likely a 2016 item, but may or may not appear in an offline retail store. It may also be in the Sonic Gear Store, until it sells out. A solo Super Sonic mug! This is called the "Being Super Sonic" mug, with good reason, as that's pretty much the slogan in a block font on one side. (Though, Super is written over & over at increasing size) The rest of the mug is a large full color art of modern Super Sonic (fists up, charging, the usual version) art. The logo is in black near the bottom. The mug itself is ordinary white ceramic. This is made by GE Entertainment, and appears in 2017. Vandor continues on with nice designs to the end of 2016. Here is their clear-glass pint glass. It's called "Sonic Level Glass", but it's really just Green hill. However, for added interest, they've placed Tails in there, though he was never in Sonic 1. They also mix the art, with actual game-type pixelated zone features like rings, palms, & sunflowers, but then added neo-classic stock flying Tails & running classic Sonic. The base may have a blue tint in the glass itself. Where is this sold at retail? Northwest company continues to do well with the Sonic license, this time with a big beach towel. It has super big CG Sonic leaping toward the viewer, with a simple blue geometric squares & swirl blue background. It's colorful, dynamic & a nice modern addition for a towel. But where is it sold? Here's a die-cut shape Sonic classic style air freshener. It's blueberry scented! (Seems fairly appropriate) It's Sonic CD style hands on hips/concentrating Sonic (seldom used stock art) He's made of thick card, as is the standard for freshners. This is new in late 2016 early 2017 & continues the air freshener Sonic trend. Photo by Taaron. classic style coasters in a metal tin set, a ceramic mug with neo-classic Sonic running art & logo on the interior. There's also the metal lunch box (this neo-classic art piece is on almost everything here) a sports water bottle with thermal liner (air gap between liquid holding bottle & exterior part) & a big 'Sonic face only' theme mug with jumbo size & curved/unusual shape. If you look carefully, you can see that it also has printing inside, but instead of the logo, it says "I'm Outta Here". The mug has been spotted in Michael's Arts & Crafts stores in spring 2017. (Remember: this store often has great coupons, get it for a 40% off deal!) But where can you find the other items you see here? A cool, re-usable plastic cup! No need to refresh your page nor reload your browser! This strange mug photo is NOT distored. It's the mug itself that's distorted. This entire ceramic mug is leaning at an angle to the left, and the handle is similarly slanted to go along with it. It's meant to make the mug somehow look 'fast', but it ends up sort of looking...itallic? Leaning? Either way, the whole thing is glazed a nice blue, and has (possibly) Sonic Channel art of Sonic running after a soccer football with the modern logo & white speed-lines background behind him. This is made by Entertainment Earth, but was listed for a late 2014 release. However, it doesn't seem to have been found anywhere. Was it too odd? 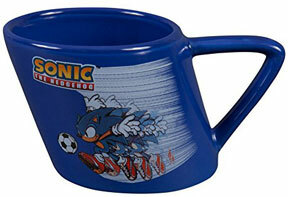 This is the only known 'tilted type' Sonic mug. It was to be released before the "boom moratorium" on modern merch, but as far as anyone's seen, all that's left of it is this photo. You can write in to confirm if you have this mug. 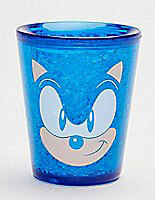 With this plastic Sonic cup, there's fun on the inside too! This is one of those double walled but clear plastic drink cups with lid. It has a red re-use-able thick plastic straw. 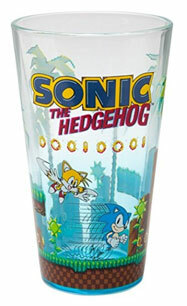 The Sonic graphic is 16-bit pixel style with him large/running on one side of the cup.It's on the interior of the double-wall though, so it's in much less/no danger of chipping up or wearing off. The whole cup & it's screw-on lid are tinted blue. The real fun starts inside though! Never water down your cold drink when you use these really cool Chaos Emerald re-freeze plastic ice cubes! A jumble of green plastic faceted re-use emerald shaped ice cubes come with this cup. There has been a Sonic ice tray before, but never a re-use cube, so these are a fun first. 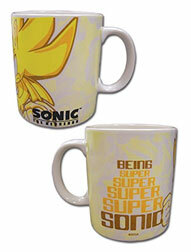 They elevate the cup much above just some product stamped with a Sonic image, by adding a layer of fun/theme. This is a Spencers' Gifts item in 2017, and should be about 11.99 in stores (generally at malls) and likely on their website. Here is a pint glass made of blue glass. It has an all-blue Sonic 'sihloutte' type (but not really because he has some details) for its deisgn. Only blue ink is used, along with the white to give him details. 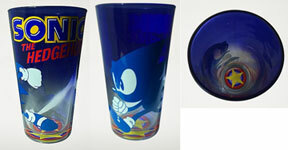 It's classic style Sonic with the classic logo at the top (it is in all-color, meaning it wasn't a money/ink decision but rather a design thing to have Sonic appear as he does) The extra detail-treat in this item is the bottom interior of the glass has a star bumper design hidden in it, for when the drink is done! Because the glass sort of fades from dark blue to clear-er toward the bottom, you can also sort of see it through the glass' sides. It combines for a fun effect, and a pretty unique glassware item to collect. This is certain to be a Spencers' Gifts item new for 2017. This shot glass has a bit of something extra inside: Freeze Gel! The glass is double-walled, and trapped within the walls is ice-pack type freezey gel substance (That's probably also blue or clear) You can put the whole tiny glass into the freezer to chill the gel, then it keeps your drink cold while you drink it, without diluting it with ice. But really...why? The glass is so tiny that there's not that much liquid to keep cool for a long time. Stuff like this gel is usually in thermos, travel cup, or a tumbler type cup to keep drinks quite cold for a while. Still, it's a fun thing to have. The design is simply forward-facing classic Sonic, without any outlines, on a blue background. No black ink is used, so the eyes/nose are also blue. It's nothing super design wise, but the gimmick is fun. This is a 2017 item at Spencers' Gifts. For Sonic Mania, here is an exclusive collectible wall poster. 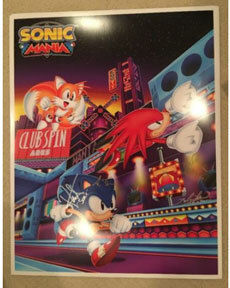 It's made of thick poster paper, and was only available / seems to be made for the event called SXSW (South by South West) It has Sonic, Tails & Knuckles running, flying and gliding a city/night area in the game. "Club Spin" is visible as a sign in the background, along with an Eggman sign. What other sign is here? The signature of one of the people who worked on the game. You can see it there in silver ink over part of the back of Sonic's head. The poster must have been available at a booth or something & then if you could find the people, maybe pay to get it signed. Of course, a signed one is worth a lot more, especially because the whole thing is limited edition/event only.